Young at a pipe repair project. Superintendent Richard Young, III celebrated his third work anniversary with Uretek Mid-Atlantic on March 19th. After receiving the distinction of Employee of the Month for January, and the Team Uretek Award— given for displaying the most team spirit in 2014—the dedicated technician credits his accomplishments to a personal commitment to the client. Young’s relatively fast ascension to superintendent can be attributed to his acute observational skills and attention to detail. “When I started I watched how the jobs went and I noticed different ways that they could be improved. From there, I made suggestions on how I thought projects could go better and they seemed to work,” said Young. 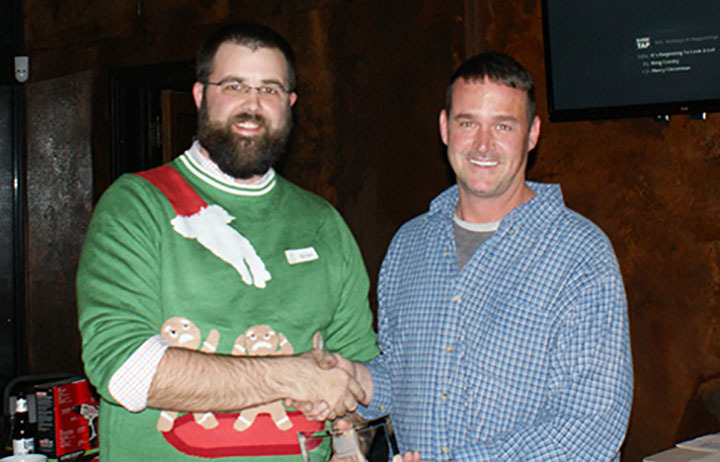 Vice President, Brian Depain (L), presenting Young (R) with the “Team Uretek” award at the 2014 Holiday Party. Uretek employees democratically select the employee of the month, and Young received the inaugural award for working well under pressure. “Ritchie [Young] has a go-getter attitude and always tries to do the best with what he’s given to get the job done,” said Uretek Project Manager, Luke McFetters.